Ward 8 Councillor Terry Whitehead has laid out his case against the city's light rail transit plan in a submission to The Hamiltonian that takes a throw-everything-at-the-wall-and-see-what-sticks approach. Unfortunately, his case does not bear scrutiny: even a cursory review finds that his "list of concerns" is filled with outright factual errors, misleading claims and bizarre omissions. Whitehead's unspoken premise throughout his entire argument is that nothing will change in the next 30 years after LRT is built. In other words, he starts with an assumption of failure and then, lo and behold, concludes the LRT project will fail. But within that larger false premise are a number of specific claims that are factually wrong or used in a misleading way. This is not an exhaustive critique, but just a cursory review of the most obvious howlers. Whitehead claims near the top of his list that the operating cost for LRT would be $1.80 per passenger. In fact, the Rapid Ready LRT Plan [PDF] states that the operating cost for LRT would be between $0.95 and $1.80 on opening day (depending on the level of uptake), compared to a net cost of $1.07 for B-line, and would drop to a net revenue of $0.75 by 2031, compared to a net subsidy of $1.12 for buses. By entirely discounting future growth in the economy, population and ridership, Whitehead is like an entrepreneur trying to decide whether it would be profitable to open a store based entirely on whether it would turn a profit on opening day. LRT actually has favourable ridership projections on day one, but the real benefit is over the longer term. Then Whitehead claims that the peak passenger level on the B-Line express bus is only 444 per hour, with the remaining passengers on local buses with closer stops. According to the 2010 HSR Operational Review [PDF], there are about 1.35 million riders per year, which amounts to 1.35 million / (52 weeks * 5 days * 12 hours) = 433 passengers per hour on average, since the B-line only operates a full service for just 12 hours per weekday. Combined with at least a 20 percent increase since 2009, this suggests a current average hourly ridership of 520. There is no way the peak ridership can be only 444! This is not to mention the fact that there are only 11 total express buses per hour in both directions, and 11 percent of B-Line buses were over-capacity. That tells us peak ridership is limited by capacity, not demand. And, of course, most people take whichever bus arrives first and has space; they don't just wait for the 10, so it is misleading to imply that only current riders of the 10 will take LRT. Similarly, 12.5 percent of King 1 buses are over-capacity at peak times, and there are lots of drive bys. Whitehead also repeats a common misrepresentation of a 2013 report by McMaster researcher Chris Higgins by claiming that Higgins says other things in addition to building LRT need to be done to take full advantage of the economic uplift, and then implying LRT will fail because we won't do those other things. Implement transit-supportive land use policies and provisions in any relevant municipal Official Plans, Secondary Plan and Zoning By-laws, and in doing so, shall be guided by the Ministry of Transportation's Transit-Supportive Guidelines. These "transit-supportive land use policies" are precisely the changes Higgins says are needed to achieve the full benefit of LRT. And that's before investing in LRT! In the Chris Higgins report Whitehead cites, he claims that it states LRT will not reduce automobile usage, including the following partial quote: "LRT in and of itself should not be expected to mitigate regional congestion." Again, Whitehead acts as if we will implement LRT but then fail to implement the land use and transit supportive policies that are proven to maximize the benefits of LRT. Next, Whitehead claims the Metrolinx Benefits Case Analysis is evasive about speeds and misrepresents what the BCA says in Table 4. The speeds are: 35 km/h per hour except 33km/h from Ottawa to Longwood and 25 km/h in the downtown core (as distinct from "Downtown" from Ottawa to Longwood). The BCA notes: "travel speeds in the downtown core are assumed to be somewhat slower in the range of 25 kph." Does the 25 km/h slowdown in the downtown core significantly lower the average speed? Is this some nefarious attempt to drastically over-estimate the total average speed? Of course not. They used the 33 km/h speed overall because it makes no difference at the level of approximation their considering (+/- 1 km/h at best). 10.7 minutes (from Ottawa to Longwood apart from the downtown core) + 3.1 minutes (downtown core from Wellington to Bay at 25 km/h) = 13.8 minutes. If you assume 33 km/h for the whole section, the travel time is 13.1 minutes. So this "error" amounts to 0.7 minutes on a 26-minute total time. The average speed drops only marginally from 32.8 km/h to 31.8 km/h. Or to use precise numbers for each of the sections, the total travel time increases from 25.1 minutes to 25.8 minutes (33.9 km/h to 33 km/h). Or, taking numbers rounded to the nearest minute, as in table 4, we have 14 minutes instead of 13 minutes for the central section. Whichever way you look at it, it makes a difference of 1 minute, or 1 km/h in the average speed. That is of course negligible for this sort of estimate, which is why Metrolinx didn't bother using the lower 25 km/h speed for the downtown core. There is no issue once you actually calculate the speed difference. It's well within the margin of error and still much faster than the 25 km/h assumed for BRT. Using the average speeds in the BCA, the travel time from Queenston Traffic Circle to McMaster would be about 20 minutes, not the 24-25 minutes Councillor Whitehead has been claiming on twitter. Another obvious point is: why did it take Whitehead six years to get around to reading the BCA and three years to get around to reading the Rapid Ready LRT report and start asking questions? Especially as these questions could have been easily addressed back when there was still a Rapid Transit team. In another misleading claim, Whitehead quotes the BCA giving a benefit-to-cost ratio of 1.1 for LRT and 1.4 for BRT and asks, "Why are we spending more money to get less benefit?" And in any case, many of Whitehead's concerns about traffic disruption during and after construction would also apply if we had chosen BRT, only the overall benefit to the City would be much lower. In addition, the operating cost per passenger for BRT is much higher than the operating cost for LRT, and the peak capacity is significantly lower. For these reasons, it is hard to imagine Whitehead not opposing BRT as well. His BRT argument is really just an attempt to undermine LRT - he is not really arguing for BRT as a viable alternative. Most importantly, the benefit-to-cost ratio might matter more if Hamilton was paying the capital costs, but we're not - yet we still get the much higher overall benefit of $852 million compared to just $313 million for BRT. Why wouldn't Hamilton want over half a billion dollars in additional actual benefits, especially if we're not paying the capital cost? It would be crazy to turn down $539 million in extra benefits. In addition, the BRT cost estimate in the BCA is only preliminary. According to analysis by the Institute for Transportation and Development Policy, full BRT costs around half as much to build as LRT (and produces around half the return on investment in terms of new transit-oriented development). Whitehead's false contention about the benefit-to-cost ratio is an example of another misleading premise running through Whitehead's argument: it is the Province, not the City, that will be paying the full capital cost for the LRT plan, but Whitehead keeps writing as if "we" have to foot the bill, not the Province. He might argue that it doesn't matter who's paying for it if it is not a good project, but it makes a huge difference whether the City is spending its own money - money it must borrow and/or can't spend on other priorities - or whether the money is in addition to our regular spending. Even if you reject the (very conservative) economic uplift estimates, this $1 billion Provincial investment will produce thousands of construction jobs for Hamiltonians for several years. In any case, the City and Council - including Whitehead - steadfastly pursued the project for six years, provided they got full provincial funding. Nothing fundamental has changed. Whitehead claims the LRT will entail "diverting 20,000 cars a day," causing "much more congestion" and more cut-through traffic in local neighbourhoods. He does not state where his 20,000 cars a day claim comes from, and the traffic modelling being undertaken as part of the LRT implementation and Transportation Master Plan review has not even been completed yet, so it is not clear how he came up with this number. He may be referring to the average daily traffic volume along King Street from the east end through downtown, which is around 18-20,000 cars a day. However, by using that number, Whitehead assumes there will be no more car trips on King Street, even though it will still be two lanes (one in each direction) for nearly all of its length. He also assumes that no one who is currently driving will switch to LRT, which is extraordinarily unlikely, and that no one will change routes, choose different destinations, shift driving times, carpool or otherwise do anything to shift their driving pattern. Which is to say, he assumes LRT will fail and then uses that assumption to predict its failure. Let's wait for the traffic modelling study to be completed instead of inventing numbers. As for Whitehead's claim that building LRT will produce "a Toronto transportation solution that has resulted in traffic gridlock", he gets it exactly backwards. Toronto's traffic congestion is in large part a result of the fact that investment in transit has not kept up with population growth. The best way Hamilton can achieve "a Toronto transportation solution" is to do nothing and wait for congestion to become intolerable. Whitehead argues, "We must comprehensively provide a greater level of service in all geographic areas of the city before we start making it more difficult for people who do not have viable transportation alternatives." This is the same Whitehead who voted against the bus lane, which was supposed to be the first part of a citywide network of dedicated express bus lanes. And year after year, Whitehead also refuses, as part of Council, to put any ratepayer money into trying to implement the HSR Ten Year Transit Strategy, even though the initial proposal still had nearly all of the additional revenue coming from riders. What exactly has Whitehead done in his 13 years as a Councillor to "provide a greater level of service in all geographic areas of the city" aside from voting to support LRT? Is he dedicated to fixing area rating for transit, increasing the HSR budget, or anything else that would support this goal? With LRT, at least, buses currently serving the B-Line will be freed up to increase service in underserved areas. Remember that if Hamilton turns down the $1 billion for LRT, we will lose that money to another city whose approved project is waiting for funding. We will lose out on LRT and also not get any money to improve local transit - a lose-lose proposition! Does Whitehead really care about improving transit service, or is this, like his sudden interest in the BRT alternative, merely another concern-trolling way to undermine support for LRT without actually providing an alternative? Yet another misleading claim is Whitehead's contention that the Rapid Ready report was a plan to get Hamilton ready for LRT rather than a plan to implement LRT with Provincial funding. Yes, Whitehead has decided to follow the lead of former mayor Bob Bratina, who tried to claim after the fact that his vote for the Rapid Ready LRT plan was not actually a vote for the LRT plan. In terms of where we've been all along, we've been focused all along on the B-Line and advancing the detail of that B-Line so the Province can make a decision on the B-Line. Okay? We think investing in transit, LRT specifically, in the City of Hamilton is something fundamental to our growth, and that, you know, it's really at the end of the day up to the Province to make a decision about what it is it wants to invest here in Hamilton. I'm trying to understand how people like to try muddy the water when in fact there's no conflict here. If the Province and Metrolinx do not like where we're at or do not think we're prepared or ready for the B-Line, we have now provided them options in the rapid transit report. There's no conflicts here. I don't know why people are creating conflicts. There's absolutely no conflicts by supporting and reaffirming the position we already took. And here's another point, um, Deputy Mayor, we would have had to have two-thirds vote, two-thirds vote to support the rapid report if it was in conflict with the original position of supporting the B-Line. So obviously everything links in well together. And I don't know why this game is being played. Yet here we are today, just three years later, and Whitehead is playing that very game himself. Update: an astute RTH reader alerted us to the fact that Whitehead took a statement from the Higgins report out of context in order to imply the opposite conclusion of the report. You can jump to the added section. Update 2: Added a section rebutting Whitehead's claim that LRT will displace 20,000 cars a day. You can jump to the added section. Update 3: Added a section rebutting Whitehead's argument about increasing HSR bus service. You can jump to the added section. Thanks for taking this on. Have some thoughts of my own regarding the Councillor's remarks which I am preparing; I don't think it will have the same impact as this excellent response. This haphazard grab-bag of made-up points by Whitehead (or whoever prepared it for him) is what happens when you make up your mind about something first and then decide to pick through the data to try and prove the conclusion you already made. It's intellectually bankrupt and a grave disservice to the citizens who depend on our leaders to make decisions in good faith. I would like to know who prepared this for him. It is reprehensible, and should even be considered criminal given what is at stake. Except in this case Whitehead has changed a pro-LRT position he held for many years, including when he voted in favour of the 2013 Rapid Ready report. Bizarrely, he is trying to use the evidence he used to support LRT to bolster his new opposition. Unfortunately, he can only do this by claiming he never actually supported LRT in the first place (despite his unbroken history of pro-LRT votes since 2008). In fact, Terry was at the Provincial announcement of full funding last year at McMaster cheering loudly! (I was sitting in the row just behind him). He clearly thought the current proposal was a good idea then. And nothing at all has changed. Of all the councillors Whitehead is the most butthurt about downtown getting anything(LRT being the biggest). I'm not sure if this is some kind of show he is putting on for his ward or maybe he just likes the attention. He certainly doesn't care this much about other parts of Hamilton. He's trying to stir up resentment as part of his Mayoral Run. Plain and simple. A page right out of RoFo's text book. I'm thinking he is just beating his chest for his constituents ( that is the one's that bother to vote ). Also wouldn't be surprised if there are back room discussions over who gets to vote No to Clr Merulla's meaningless motion. They ( Whitehead, maybe Skelly? ) will want to make sure it still passes but be able keep No side bragging rights. Right out of Rob Ford's playbook. Clr Collins is a different story. He needs this thing to fail. I'm sure he needed a new pair of underwear when the funding announcement was made. The change and excitement around the LRT will be everywhere - except Ward 4 - and he is going to have to answer why that is. He picked his poison and when those trains start running he's going to have to drink it. Lol. True, but re. Collins u mean ward 5. I'm 90% sure Whitehead will vote yes in the end, yet he is devoting copious time and energy to spreading FUD on behalf of opponents. I honestly have no idea what he's playing at. He wants to be mayor and because he has no vision he uses his loudness to compensate. Again, text book RoFo move. Ultimately if it were not for Sam Merulla opening up yet again this door to councillors over debating issues that have already been voted on 10 times, it would have been more difficult for Terry to pry open. Because of Sam, Terry along with Chad were able to ramp up their misleading and misguided attempts to sabotage the economic bounce and city building opportunity this $1 Billion provincial injection will offer us. I'm blaming Merulla for sucking us back down this road. It wasn't just a risk for him to put LRT to it's 11th vote, it was a reckless decision for political theatre and ego points. Sad that. I'm still not sure to what extent Councillor Merulla's motion created or merely exposed the current political situation, but his motion was a response to the appalling performances by Councillor Whitehead and Collins at the LRT Sub-Committee meeting, which they did their best to turn into an anti-LRT sideshow with a load of questions and demands of staff that were calculated to create as much noise and uncertainty as possible. I agree. Collins, Whitehead and others have been out to kill LRT since day one, despite votes to the contrary. I think they wanted to appear agreeable only and didn't ever anticipate it might happen. Now that it is true colors are showing. Murella knws that so he's just exposing it for what it is which is sickening hypocrisy and who knows what else is underlying these attempts to sabotoge progress. I'm starting to think they voted for it mainly because they didn't actually believe the Province would ever deliver. Now the Province has called their bluff by keeping its end of the bargain, and the anti-urban councillors are running scared. I really hope Whitehead is gone in the next election! He has to go. If you follow the links you will find information about the ongoing Ward review in Hamilton. This week Councillor Whitehead hosted a combined neighbourhood meeting that included our neighbourhood. (Southam) Councillor Whitehead started with his version of the LRT, for about 20 minutes. He also had his LRT petition front & centre, when I signed it it was about 50-50, so you probably won't see him referring to that meeting. The first question was about the rental sub-committee of which he is a member. For the next 1.5 hrs all but one of the questions and comments were on the condition of the rental housing around Mohawk College and peoples experience over the last years with the rentals. It is worth noting that his Executive Assistant estimates about 70% of what were originally single family homes are now rentals with usually between 6-8 bedrooms in what were once 2-3 bedroom houses. Councillor Whitehead appeared ill prepared for what transpired and seemed like a deer in the headlights at times. This was particularly satisfying for my wife & I as we have been told we are the only ones out of 50,000 who bring some items forward. Funny thing is when I emailed a question about the rental sub-committee to the 3 Councillors on the sub committee I got personal responses from the lower city Councillors but no reply from my elected rep. Only one person approached him after the meeting to ask about LRT. One of the possible outcomes of the Ward review is a new ward created on the South Mountain, if this were to happen I suspect Whitehead would run there & open up the North end of Ward 8 for someone new. He is on 4 committees and 20 sub- committees including the LRT sub- committee. I don't use twitter but if you follow the blog on his website the only thing he is tweeting about is LRT. What I find curious is that we keep hearing how busy he is looking after over 50,000 constituents but he seems to have fixated on LRT. If he is fixated on one thing how is he dealing with other issues and committees he is on? I also find the timing really odd, he is on the LRT sub- committee and had to know this information for over a year. If he had concerns why didn't he question it last year when it was announced? I was really hoping to hear from you on this. I heard that this was occurring. I had also heard that Clr. Whitehead had been called out by Matt Jelly re: Whitehead's assistant running multiple neighbourhood associations along the Brow, and wanted to hear what was going on in the meeting. Thanks for the update. I am really, _really_ hoping to have the Councillor hold one of these sessions in or near my neighbourhood. I think that, given his reaction over the past few years to two-way conversions, the King St bus lane, Aberdeen street calming and his changed position on LRT it is clear that for some unknown reason Councillor Whitehead has become obsessed with initiatives in the lower city (particularly wards 1-3). He spends an inordinate amount of time and energy fighting every single one of these initiatives, tiny or huge, cheap or expensive, even though they are strongly supported by the residents, councillors and and neighbourhood associations. opposing the King St bus lane because it takes space from traffic and is bad for business, but apparently arguing for a b-line BRT in his Hamiltonian article which would be an even bigger permanent disruption to traffic (and would have buses every five minutes or so). opposing street calming and limiting cut-through traffic in wards 1 and 2 but arguing that LRT would be bad because it would increase cut-through traffic in his Hamiltonian article. explaining at Council in 2013 that Rapid Ready was clearly a plan and request for LRT and now arguing it wasn't. complaining about staff winning a competitive process for bike lane funding on Bay street because they should be building more bike lanes in his ward, despite previously arguing that bike lanes should be removed on Stone Church because they impede traffic and parking. I do find the amount of time and energy he spends fighting initiatives in other wards inexplicable. And this attitude is not reciprocated: when Whitehead pushed for a study of sidewalks on the mountain he had the full support of lower city councillors! He doesn't find other councillors trying to micro-manage changes in his ward using equivalent arguments (it would make it harder to get to the airport, Limeridge Mall or Mohawk; Garth and West 5th belong to everyone, etc., we're tired of all the money being spent on the mountain on new facilities ...). It is interesting that his energy fighting initiatives popular elsewhere does not seem to be matched by his energy pursuing initiatives in his own ward (except to the extent he claims that his residents top priority is stopping progress in the lower city). please turn this and all his other flip flops into a feature article! It's also a "but what about me" setup. If the lower city gets something, he immediately wants the same for the mountain. It's as if he thinks it's a contest - and that if one side gets something he should also get something. It's silly and unbecoming a city councillor. especially in light of Hamilton's spending and subsidy priorities over the past 50 years: very suburban focused. In some lower city hoods the feeling has existed for decades of being all but forgotten. But even aside from all that, his behaviour, and some similar comments from Jackson and Collins is embarrassing and petty. What would all 3 of them said if councillors from other regions of the city had vehemently opposed Red Hill and Linc, not on any environmental basis, but on the basis of "it's not fair for those wards to get such a big investment. We will try to halt it until someone gives my ward something". Collins ward was actually going to get LRT but instead opted for a Go Station. Why he opposes LRT elsewhere is beyond me, especially when he got the thing he wanted. indication of someone's character. Well documented that behind the scenes negotiations happened to end LRT prior to Ward 5 in order to win his support. He got his GO Station, and no LRT in Ward 5, then still decides to oppose. Be careful what you wish for. No guarantee we'd get someone better, and we could get someone a whole lot worse. Ward 7 was won by a nose. JP Danko lost by a very small margin and he ran on a firmly Urbanist pro-lrt platform. Of course, I'm just saying that Jason's extreme pessimism about the mountain, that it will inevitably elect people like Skelly, is misplaced. If the NDP hadn't split its support between two candidates - Uzma Qureshi (1,521 votes) and Geraldine McMullen (720 votes) - the NDP-supported candidate would likely have won. Between them, Qureshi and McMullen totaled 2,241, more than enough to beat Skelly's 1,967. That said, for me the most fascinating thing about the by-election was that John-Paul Danko was able to garner so much support with a progressive agenda and without any partisan apparatus. Danko had to do it all from scratch - build and manage a campaign team, raise funds, organize volunteers, reach and appeal to residents, and marshal support on voting day - and without an existing organizational infrastructure to lean on. His second-place finish is an amazing accomplishment by any measure! Whitehead seems on his way to becoming that "worse". This process is making him nastier over time. I used to be able to play devil's advocate about his comments, but there's nothing to defend anymore. Luckily even his colleagues understand he's a buffoon, so he's not likely to sway any votes. Could you imagine if he was replaced with someone equally visionless but politically savvy? Yikes. 11 percent of B-Line buses were over-capacity. That tells us peak ridership is limited by capacity, not demand. Kevin’s comment: The phenomenon of Induced Demand also applies to transit systems. This leads me to predict that within two years of the LRT system opening, ridership will be up significantly as the latent demand becomes actual use. Which, of course, means a significant increase in economic activity. Those extra riders are not riding for a recreational experience. This increase in economic activity is one of the key reasons for the LRT. Whitehead keeps writing as if "we" have to foot the bill, not the Province. Kevin's comment: I am very far from being a supporter of Mr. Whitehead, but he is correct on this one particular point. The Province is us and citizens of Hamilton are provincial government taxpayers. The Province is us and citizens of Hamilton are provincial government taxpayers. If Hamilton pays the bill, the $1 billion cost is divided among 500,000 residents. If Queen's Park pays the bill, the cost is divided among 13.6 million residents. Would you rather be on the hook for 1/500,000 of a billion dollars or 1/13,600,000 of a billion dollars? Also, keep in mind that if we turn the investment down, we will still pay but the money will go elsewhere. This is a very important point people tend to gloss over. In the current situation those taxpayers are the residents of Ontario and they are paying whether the LRT goes to Hamilton or not. Hamiltonians don't save any money at all by turning down the Province's offer of funding. In fact, Hamilton taxpayers lose well over $800 million in benefits (including $80 million in infrastructure costs we would have had to pay ourselves). The average cost to Hamilton residents is about $74 million in provincial taxes, but we get $1 billion in investment. Just considering the $80 million in infrastructure costs, we come out ahead! This is a good deal as we are only paying 7.4% of the cost through provincial taxes which we would be paying anyway. If we don't take LRT our $74 million goes to the next project on the list, and there are lots of cities that would be happy to take it. Completely agree that this point is being glossed over, or not even brought to the forefront in discussions. Personally I think that should be the question posed to the public. And he says most of his constituents are against the LRT but never gives the "why". Instead of pandering to the us vs. them mountain vs. lower city, does he see no responsibility to educate and inform his ward of the benefits to the entire city? This ward heeling parolchialism needs to stop. If he's the one misinforming his constituents about LRT no wonder some of them are opposed! Within two years of the LRT opening, ridership will be up substantially over the present HSR ridership on this route. The City of Hamilton has committed to appropriate transit-oriented zoning and development along the LRT route. Provided this commitment actually happens, I predict that Hamilton will experience the same economic boom along the LRT line as Toronto experienced along the Yonge subway. Toronto did put in place appropriate zoning and development along the Yonge subway route, resulting in the "Toronto Mohawk", a spine of high-density buildings and development along Yonge Street that is easily visible from the air. The more appropriate example is the Bloor-Danforth line, which functions like a street-car line in terms of distance between stops and has very little "high-density" redevelopment along it ... and where it does, such as near High-Park there were some serious battles by neighbourhoods during the late-1960s, early-1970s reform period to oppose it. I was named after a family friend who was one of the TTC's chief subway designers and I tended to get the information that wasn't public. Actually, the real problem on the Queen Street Subway was geology and scope. The Queen Subway was never going east of Woodbine it would swing north in the same way the current Downtown Relief Line and would snake its way north to Eglinton and Don Mills. It would still destroy the streetcar in Toronto. The reason the DRL line swings north at around Pape Ave is that east of there, the soil starts to become unstable, with increasing amounts of sand, which greatly increases digging costs. There was also a question of how far west it could really go. Once you got west of Bathurst in 1970's Toronto, you were going through pretty nasty territory and there was a real question west of Dufferin Ave. of how much ridership a full subway would actually get and would it be worth it financially. Don't know about the geology ... certainly those factors arise. Sewell was Alderman for ward that included Queen St E on both sides of the Don River at the time (until Logan or Carlaw ... I can't remember exactly off the top of my head). He (and I think) Karl Jaffary were opposed. There was real resistance in the City for anything deemed to be for commuters (car or transit) and a strong push to decentralize office growth to North York Centre, Scarborough Centre, and Downsview (of all places). Aside from opposing the Queen St Subway progressives in the mid-1970s also opposed an Eglinton line in favour of rapid transit on Sheppard, because they thought it would be more likely to redirect growth pressures from downtown neighbourhoods. Different time, different thinking on the political level ... that was my point. Taken from a 2011 talk titled Why Transit Matters by Paul Bedford, Toronto's Chief City Planner Emeritus. The densification is even bigger now. I just noticed that this is a photo dating from approximately ~1990. The SkyDome is built (1989 earliest bound) but the waterfront condos are missing from this! I see many missing 1990s-decade buildings. So the Talk used a fairly old photo, which already shows densification already. There is now skyscraperization occuring at some stations along Yonge (especially Yonge-Eglinton, Yonge-Sheppard, I think over 30 storeys) and some mega-tall construction occuring at Yonge-Bloor (80 storeys). The takeaway is densification is an ongoing thing. The same thing can happen along Hamilton's A-Line over the 25 year time period after A-Line LRT is built. It does take time, though! Well here in Ottawa, the original O-Train Line now the Trillium Line was a pretty basic affair. Not a LRV but mainline railway compliant, very light Diesel Multiple Unit. In fact in legal terms, the Trillium Line is actually a Commuter Rail line not a LRT line, at least as Transport Canada defines it. We do however operate it like a diesel LRT line not a Commuter Rail Line. If you count all the money we have put into it over the last 15 years and including the original construction costs, the total bill is just under $120 Million. For that we have a 8km diesel LRT line that operates at a 10-12 minute frequency all day (5:30AM-Midnight), has a new (semi functional, don't get me started) signaling system, a single track line with 3 passing tracks. As part of the phase 2 LRT system the line will be lengthened 7.5 km to a point south of our Airport to a new park and ride station at Bowesville (which will be the furthest eastern station of the Barrhaven-Riverside Transitway). 2 new stations will be added at Gladstone and Walkley (were the 2 new passing tracks are), a third station (Confederation Heights) will be moved from 100 metres north from its temporary location to a new one with better access. There is a possible airport shuttle line being examined, as long as the airport pays for it I guess. It became official that, as of last year 2015 this line had now spawned 1 Billion dollars in real estate development in the area of the stations since it opened in 2001, especially around the Carling and Preston Area (Carling Station), the southern limit of Ottawa's Little Italy neighborhood. It started carrying 5300 people a day in 2001 it is now carrying 13,000 a day. It spawned several kilometres of new very high quality bike/walking paths and a new pedestrian bridge that links new condo developments both immediately east and west of the line. Not a bad return on investment and even with all that success, we still get people saying it goes nowhere to nowhere and its a waste of money! 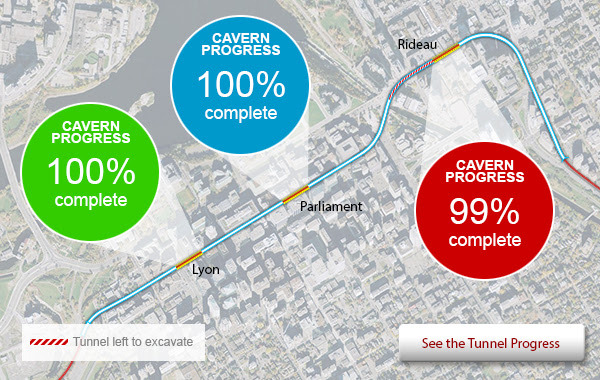 Kudos to Ottawa for approving a Phase 2 LRT extension WHILE still building Phase 1. Ottawa approved the extension (www.stage2lrt.ca) in year 2013, while the current LRT is still under construction until 2018. Hamilton's equivalent would be approving our extension in 2018 or 2022, and it's not impossible that A-Line could be part of this (at least an incremental to StJoe/Mohawk, or an A/T line hybrid to Limeridge). Kitchener-Waterloo is also on a fairly quick path to approving their Phase 2, as well. Both Ottawa and Kitchener-Waterloo are very unToronto examples (of usually much-more delayed transit projects). To be fair Ottawa's unToronto leanings as you put it are because we had Mayor from 2006-2010 who was almost as destructive as Rob Ford, Mayor Larry O'Brien. We also had a Prime Minister who actively and publicly stated that he hated the city of Ottawa, Harper. Harper cuts to 2 planned new museums while they were under construction and the outright elimination of 16,000-18,000 federal jobs. Then realizing some of the positions were needed and then hiring his buddies private companies, to do the same job while rehiring a few thousand ex federal workers and paying them 60% what they were earning before. Those unneeded government jobs were positions in the TSB and Rail safety directorate at Transport Canada. mayor Larry O'Brien cancelled Ottawa's North-South LRT project in 2006 just while it was it started construction. He cancelled a project that was under way and ignored a signed contract with Siemens and Siemen's Development Company. He boasted we would be okay, well it cost us $37 Million + damages when we lost the court case. As a consultant that simple act is still costing Ottawa money today because all consultants raise their prices when dealing with the city. The belief among the consultant community goes like this, if the city can cancel a signed contract with one the largest companies on Earth what chance do I have? What will happen if the political winds change and they dump me, I might not get paid for awhile, so get as much money as I can from them, when I can from them. So we tend to have a feeling now in Ottawa, that we need to strike right now before the government changes in Toronto or on Parliament Hill. My spouse Alain often had to let 1 or 2 buses pass (both #1 and #10) during peak period, before he could board one. The route is constrained by HSR's limit in bus count during peak. Plus, the bus often takes minimum 35 minutes at peak in traffic, Circle-to-Mac. It's easy to board the HSR bus at the endpoints but is often full along certain parts of the middle of the route in the peak-direction. Nothing further to add except my unsolicited and most heartfelt thanks. This LRT debate has just about burned out my last bit of goodwill towards my hometown. I'm not sure why Collins is so against LRT either but at least he is consistent in his eye rolling. He's likely positioning himself with the Septegenarian vote that he has calculated will carry him to the Mayor's chair. Sadly, Hamilton is following lockstep with Toronto in allowing politicians to run amok with these decisions. Toronto Life did a feature a couple years back with a says-everything headline: Gridlocked: how incompetence, pandering and baffling interita have kept Toronto stuck in traffic. A much more inspring read is Politico's feature on the years-long effort to build Denver's transformative LRT system: The Train That Saved Denver. I seem to recall hearing or reading that Terry also thought that since BRT costs less (~800M as compared to 1B) that it "makes more financial sense". However, he doesn't touch on where the $800M is supposed to come from, since it won't be the province. Terry, will you lead the charge to Queen's Park to get your $800M BRT built if LRT is rejected? I certainly won't be paying for it if you try to make the city pay for it! Ryan, have you submitted this rebuttal to The Hamiltonian or Spectator? I am undecided on this topic. I have read Ryan's piece on The Hamiltonian and then I read Terry Whitehead's piece on The Hamiltonian. I feel that Merulla opened up this can of worms and has caused many people to think about this again. I have to admit that i do nt have the expertise to know who is right on the technocal side of things. LRT has been a big topic in the core of Hamiltomn but I don't think too many people in other areas of the city care as much. I would be okay with more busses running and more coverage. They say that LRT is cheaper? But if I am right, it only goes from Mac to traffic circle and then down james? I knosw it has to start somewhere, but it seems like a lot of trouble to tear up roads and stuff. My wish is that everyone can have a discussion that is civil. I thight it was bad when some people started attacking The Hamiltonian for just asking questions. I hope we have not come to that. The reason why I am undecided is because I also found Mr. McGreal article in The Hamiltonian very good. I hope I don't get my comment deleted just by telling it the way i see it. Some people are saying that if you arwe against LRT or if you even question it, that you get bullied about. That's sad. Thank you for your comment, and I appreciate you taking the time to try and learn about the issue in order to make an informed decision. Unfortunately, there has been a lot of misinformation flowing around, including from Councillors Whitehead and Collins, who have been actively trying to confuse people about why the city and province have been studying and developing this LRT plan since 2007. Bringing its infrastructure lifecycle costs in line with its property tax revenue. To put it bluntly, the City's current land use and transportation system is unsustainable. Too much of the city is a low-density, car-dependent land use in which it costs the city more to service its municipal infrastructure (roads, water and sewer, police, fire, waste collection, etc.) than it generates in development charges and property taxes. Increase the productivity of the infrastructure we already have by adding new density within the already developed area so that the same infrastructure cost is divided among more ratepayers. LRT allows us to do #2 by attracting and concentrating hundreds of millions of dollars (eventually billions of dollars) in new residential, commercial and industrial developments on vacant and under-used properties along the LRT corridor. By bringing more destinations closer together and making it easier to travel between them, LRT allows more people to live, work and carry out other activities on the same amount of roadway. As an added bonus, when you bring a higher concentration of people and destinations together, the city's economy actually grows faster. Economists have been studying this effect for decades, and the "essential urban economies" are the main engines of economic development that produce innovations, new businesses, and the creation of new jobs. Most people are already familiar with the economy of scale, in which a larger market means fixed costs of production are divided among more customers, but that is only one of the essential urban economies. The economy of agglomeration, also known as the clustering effect, is the tendency for multiple businesses in an industry to locate close together. Competition raises productivity, and added gains accrue from sharing a larger pool of skilled workers, creating a market big enough for specialty suppliers, training partnerships with local schools, and faster transfer of innovations and best practices. The economy of density is twofold: the same land supports more uses, while the distance between destinations gets smaller. This increases choice and accessibility and reduces transportation costs. Higher density means each business has access to more customers, and each person has access to more businesses. The economy of association is the fact that people tend to create more innovations when they encounter and cross paths with more people in their daily lives. More chance encounters translate directly into faster cross-fertilization of ideas and new business partnerships. The economy of extension is the tendency for good ideas developed in one city to expand into other cities, since most cities tend to have similar challenges. LRT makes it possible for the City of Hamilton to grow faster without growing out, to generate more property tax revenue without having to build more infrastructure, to increase its economic and job growth, to get more people travelling on its major corridors (right now, well over 30,000 people a day travel on buses along the B-Line LRT route - imagine what those streets would be like if all those people tried to drive! ), and to provide a more appealing location to live for both young people - especially young entrepreneurs and professionals - and for aging Boomers who want to downsize and live in a place that does not require driving to get anywhere. If you have any further questions, please don't be afraid to ask. We are not "bullies" and will always make time for honest questions asked in good faith. Again, thank you for reaching out and sharing your concerns. Thank-you for your explanation. I hope you did not do all that just for me. But I do appreciate it. I have copied it onto my word processor because I don't have time to read it yet. I figure if you made the time to write it, I should read it when I have the proper time to truly understand it. So thanks again. My sincere wish is that people follow your lead. I got really upset when I seen people bashing The Hamiltonian. I would say the same thing if this happened to Raise the Hammer. Your explanatoon is a much better approach than the other tactics I referred to. I will keep reading and will give your reply a very serious read. No worries - it was my pleasure. Thank you for taking the time to read up on this important issue so you can make an informed decision! I hear you! I was undecided too until just recently. Those of us who live outside of downtown tend to rely on the news media or our councillor to keep us informed. Problem is, those sources tend to put a spin on the factual information. To reach my decision, I had to stop and think and try to visualize my personal future and those of my kids. After that, it was a fairly easy decision for me to see that LRT had way more positives than more buses or BRT. It fits in completely with the long term plans for BLAST - expanded public transit. Not to say there aren't any negatives but with proper planning at City Hall those can be overcome or mitigated. My concern now is that they'll intentionally mess it up just to prove a point. I was the same way. After a very spirited discussion with friends, family, and neighbours - both from our neighbourhood, our ward, and our city, I am firmly thinking that if these councillors are so against LRT, they must be fearing something that will come from the result of it being built. I was sent a ton of materials by the councillor to read and am working my way through it; it does seem that LRT is the right choice. And hey, if the province wants to foot the bill for it, we should take it! Over the years, I have found that pictures work best with people when you are trying to bring a point across. The problem with BRT proponents is that the picture they have in their mind about what is and what kind of BRT Hamilton needs probably is a lot lighter in terms of passenger carrying capacity than what will be possible with the LRT system Hamilton and Metrolinx are proposing. Once they start to understand what kind of latent passenger carrying capacity they will be giving up by dumping LRT and seeing what the equivalent BRT system actually looks like and how expensive it really is to build and operate, you will see if they are really pro transit or not. Rob Ford for example was not pro subway/anti LRT, he was really just anti transit, especially rail based transit and very much pro car. There were quite a few subway extension proposals in his beloved Etobicoke, the Sherway Gardens Extension of the Bloor-Danforth comes to mind that, he voted against as a Councilor because of noise issues, even though it was going through areas were very few people would have complained about noise from a subway located near an existing expressway. He probably didn't like it because it would have eventually taken a potential lane away from the expressway right of way. 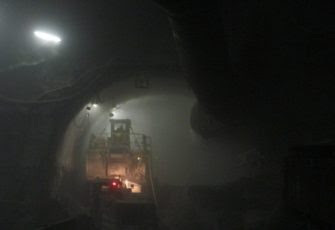 The digging for Ottawa’s Downtown LRT Tunnel is almost done. 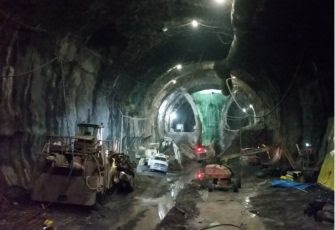 The breakthrough at the Rideau Station Cavern west wall is expected next week or the week after! This just in, Ottawa got its Phase 2 LRT Money $1 Billion+ from the province! And that is why Terry Whitehead needs to exercise patience. We can have an extension funded in 2018 or 2022. Extensions DO get approved even before construction is complete.